Bio: Claudette Gamache followed a career as a registered nurse, but her passion always remained in the arts. As mature student, she received her BFA from the University of Hartford. She combined her interests to pursue an MA in Expressive Arts Therapies and Holistic Studies at Lesley University and later became a registered art therapist. 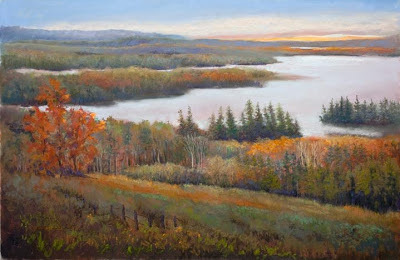 Claudette is a Signature member of the Pastel Society of America, Pastel Painters of Maine, the Ct. Pastel Society and a Master Circle member of the International Association of Pastel Societies. She is a contributor to 100 Ways to Paint Landscapes (International Artist Publishing 2004). She has presented to many groups in the art and health field in New England, New Orleans and Beijing, China. She is in Who’s Who of American Women and American Art. Her work has been selected for a national invitational show of the Pastel Painters of America held at the Butler Institute of American Art in Youngstown, Ohio. Her paintings, which number well over 500, hang in many corporate and private collections. Claudette lives at Popham Beach, where she works plein air as well as in her studio; she teaches workshops in Maine and is a mentor for the MFA program at Heartwood College of Art in Kennebunk, Maine. Medium: Pastel. Claudette uses a layering technique - up to 20 layers. Choosing the proper papers, pastels, brushes, turpenoid and fixatives helps to make this process work. She states that her practice of layering colour over colour, taking it out with a brush, reflection, connecting with and repeating this process many times can last for days, weeks or months. Style: Representational with an element of impressionism. Gallery: Nature Landscapes; Coastal Paintings; France. Image View: Thumbnails enlarge in a lightbox viewer and may not be downloaded. Most enlargements carry a title and size. Bunker Hill is 27 x 38 ins.